I'm not one for sabre rattling or events that create more spectacle than substance, but I sure am glad that the 2015 NHDP convention was held and covered widely, even by the national press. My excitement has less to do with the candidates that were speaking, or the parts of their platforms they covered. Those elements were very predictable; and if you keep track of politics, as I do, you have heard these speeches and sentiments dozens of times at this point, sometimes in their entirety. If you already align with one candidate, and attend local candidate events, you probably have heard the same sentiments, time and again, even more often. Dems won at this NH convention. 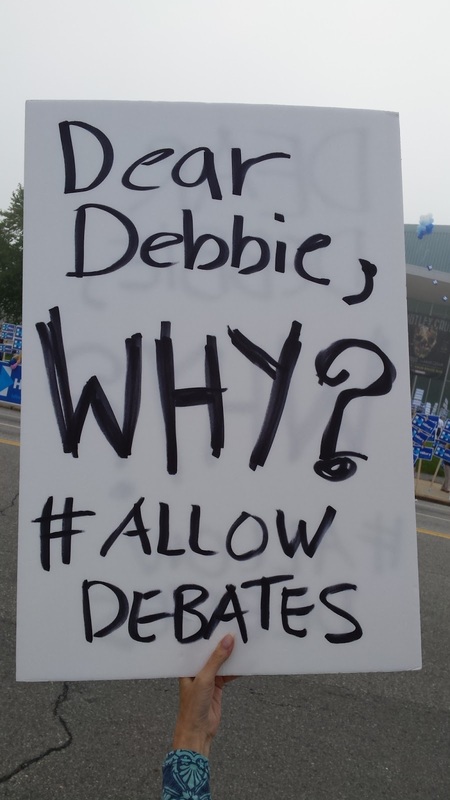 But we did not win because of delegates, candidates, speeches, buttons, or placards, but rather because activists took the opportunity to show fellow NH Dems, and the world, that we, as a party, still have things to say. Democrats want to go beyond the party platform, beyond personal politics, and well beyond the "guidance" of our party officials. We, as individuals and members of the party, can still make our voices heard, even when they are being ignored or suppressed. We are still relevant parts of the democratic process. That's exciting. A large portion of the coverage of the convention surrounded Debbie Wasserman Schultz and her unchanged positions on having more debates and continued threats of sanctions on fellow Dems who don't stick with the dictated marching orders of the Party elite. Activists provided a counterpoint to those Party elites, both outside and inside the arena. Activist actions brought people together from all candidate camps and unified them for a noble, very democratic purpose. While many worked together to make that happen, the true beauty was the serendipity in many of the actions from the audience. It gives me much hope for our party and for human beings as a whole. 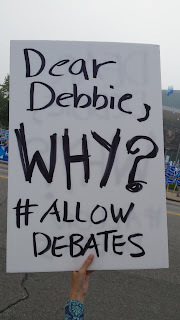 Open debate, open critique, open information exchange brings forth the best parts of who we are as Democrats. It allows everyone to see us at our best, and our worst, and allows us to change what needs to be changed, and embolden what we already do correctly. Some Dems are not happy with what happened at the convention. They see it as an attack. They see it as division. They see it as chaos where there should be order and focus. I disagree. I understand how hard it is on people when their expectations are not met. I understand disappointment and uncertainty, but I cannot understand how anyone could see active dissent and not see our ideals being expressed in that dissent. In the history of our nation rarely have we ever seen real progress without protest. We don’t advance without pushing ourselves out of comfortable positions. Small groups of committed, passionate people have defined action for every major social change we have spearheaded and won. There is never a convenient time for protest. Every moment is the best time to seek redress for what ails our Republic and for what ails our party. If these protests show us anything, they show us that we still have the voice, the focus, and the commitment to take on our own Establishment as well as our foes on the other side of the aisle. The only thing stopping us, is us.